SANTA ANA LANE (g. by Lope de Vega). 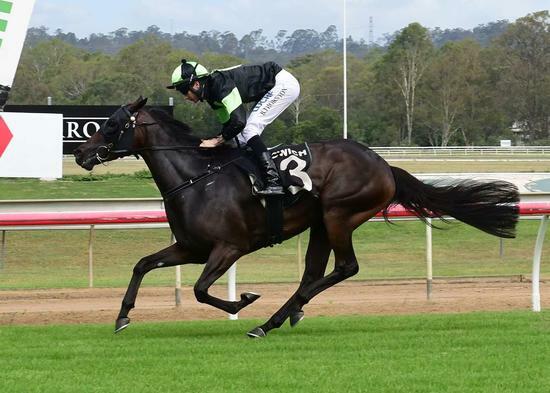 5 wins to 1400m, A$623,700, to 2017-18, MRC Sir Rupert Clarke S., Gr.1, Zeditave S., Gr.3, Murrumbidgee TC Wagga Wagga Town P., 2d ATC South Pacific Classic, L, 3d MRC Heath S., Gr.3, Testa Rossa S., L, Regal Roller S., L, ATC E-Group Security H., 4th MRC Gothic S., L, MVRC Bendigo Bank H., L, Abell S., L.
FLAG OFFICER (Excites). 5 wins-2 at 2-from 1100m to 1800m, A$278,450, WATC TJ Smith Trophy, L, Alligator Airways H., Westspeed Nursery H., Crown Perth H., 2d WATC JC Roberts S., L, Magic Millions Perth 3YO Trophy, Westspeed Nursery H., Donate to Passages H., Westspeed 3YO H., 3d WATC Challenge S., L, Westspeed 3YO H., Stavros Vitsas H., 4th Western Australian Derby, Gr.2. Strategy (Danehill). 10 wins to 1500m in Macau, Macau Guineas, Macau Curragh H., Gold Group Fat Choy Cup, Ranchi H., 2d Macau Chairman's Challenge Cup, L, Ripon H., Japan Racing Association Trophy, Sing Pao Spring Trophy, 3d Macau Cup, L, Macau Autumn Trophy, L, Spring Trophy, L, Winter Trophy, L, Macau Hong Kong Trophy, Japan Racing Association Trophy, 4th Macau Autumn Trophy, L, Winter Trophy, L.
American Victory. 2 wins at 1400m, HKJC Lung Hang H., Chevalier Pacific Coffee H., 2d HKJC Fuzhou H., A Dream Named Desire II H., Kirara H., 3d HKJC Dongguan H., Lai King H.
Fast Fleet. Winner. See above. Sea Level Drive (Malibu Moon). 4 wins-1 at 2-from 6½f to 8½f, Keeneland Allowance, 2d Arlington Park Pucker Up S., Gr.3, 4th Keeneland Doubledogdare S., Gr.3, Tampa Bay Downs Hillsborough S., Gr.3. Producer. Cascade Rose (Giant's Causeway). Winner at 2, 2d Emerald Downs Barbara Shinpoch S., L. Producer. A. P. ARROW (A.P. Indy). 5 wins at 9f, 1¼m, US$1,163,887, 1,104,000Dhs, Churchill Downs Clark H., Gr.2, Gulfstream Park Skip Away H., Gr.3, 2d Gulfstream Park Donn H., Gr.1, Hawthorne Gold Cup, Gr.2, Louisiana Downs Super Derby S., Gr.2, 3d Churchill Downs Clark H., Gr.1, Gulfstream Park Donn H., Gr.1, Hawthorne Gold Cup, Gr.2, Gulfstream Park H., Gr.2, Arlington Park Washington Park H., Gr.2, Belmont Birdstone S., L. Sire. ALMONSOON (Giant's Causeway). 5 wins from 1m to 1½m, US$249,386, Monmouth Omnibus S., L, Churchill Downs Allowance, Gulfstream Park Allowance, 2d Gulfstream Park Orchid H., Gr.3, 4th Arlington Park Modesty H., Gr.3. Producer. Stage Shy (Theatrical). 4 wins from 9f to 11f, Sandown Mears/EMT Partnership S., Del Mar Allowance, Santa Anita Allowance, 3d Santa Anita Carleton F Burke H., Gr.3. Producer. Vindgari (Vindication). 5 wins from 5½f to 8½f, 2d Assiniboia Downs Gold Cup, L, Wheat City S., Free Press S., 4th Assiniboia Downs Gold Cup, L. Sire. Hellenistic (English Channel). 3 wins from 9½f to 11¼f in Ireland and U.S.A, 2d Suffolk Downs Distaff Turf S., L.
Dreaminofthewin (Successful Appeal). 9 wins-2 at 2-from 5½f to 8¼f, US$309,119, 2d Oaklawn Park Smarty Jones S., L, 3d Lone Star Park Texas Mile S., Gr.3, Prairie Meadows Iowa Derby, Gr.3, 4th Lone Star Derby, L.
Comes the Dream (Lion Heart). 6 wins from 1m to 1½m, US$287,387, 3d Woodbine Toronto Cup, L.
The Program (Harlan's Holiday). 3 wins-1 at 2-at 1m, 8½f, US$214,077, Santa Anita Allowance, 3d Santa Anita Sham S., Gr.3, 4th Hollywood Futurity, Gr.1.